Hey Man ! rise and shine, whats wrong with you ? Look at me can you do this in the air tap tap tap tim tadamp tam tum..... oooo what a feeling, Hey c'mmon be a sport. Look at this guy with the camera, he's taking our picture and he's gonna write about us on his computer, look ! this is how he's gonna type on his keyboard tip tip tap tatupp !. How funny ! these humans are so funny. I've tried to amuse myself with funny thoughts but not very successful at that. Been working day night, tired, physically mentally exhausted, Finished the work little before deadline. Its a good feeling but now I have to stay away from the computer for a few days, my shoulder is about to fall off. Right from my childhood I maintained the freedom to take off any time I wanted. Money was always the problem, got some money and I have to go. I'll be back in a week. Not in a happy frame of mind, I am fine, no problems here. Been thinking of enlightenment and nirvana, don't know how people manage to stay in such state, when things are not ok with your friends and the world around you, does the enlightenment or nirvana supposed to make one insensitive? Thank you Anastasia, oweee what a name !! Yes they are a funny lot, its a joy observing their activities, and I am not getting tired of painted storks, have posted many pictures and blogs on them in the recent past. i guess that's just the reason most people can't achieve it - they feel other's pain too deeply. I can only assume that not every one feels other people's pain as their own, or at least not so deeply. How true ! you speak far beyond your years Laila. Its so sad people with wisdom don't understand this and keep running after enlightenment. 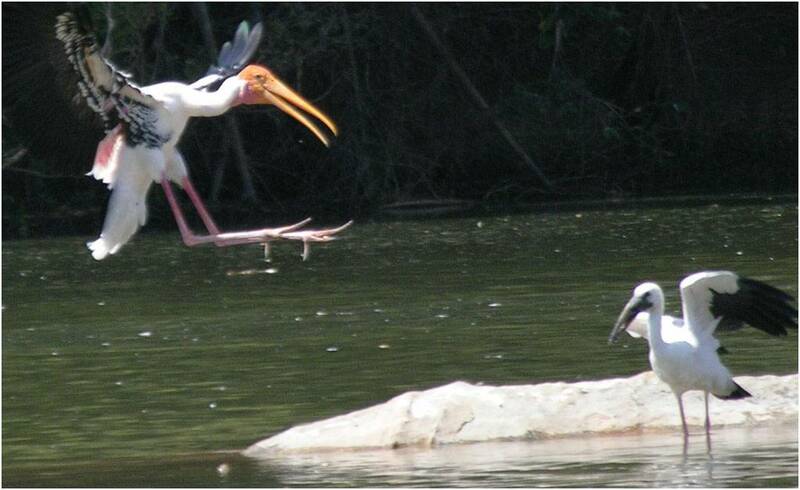 Please see Blunt knife for spoonbill stork Laila. feel the pain, move on... it's tough, but i am slowly getting better at it. 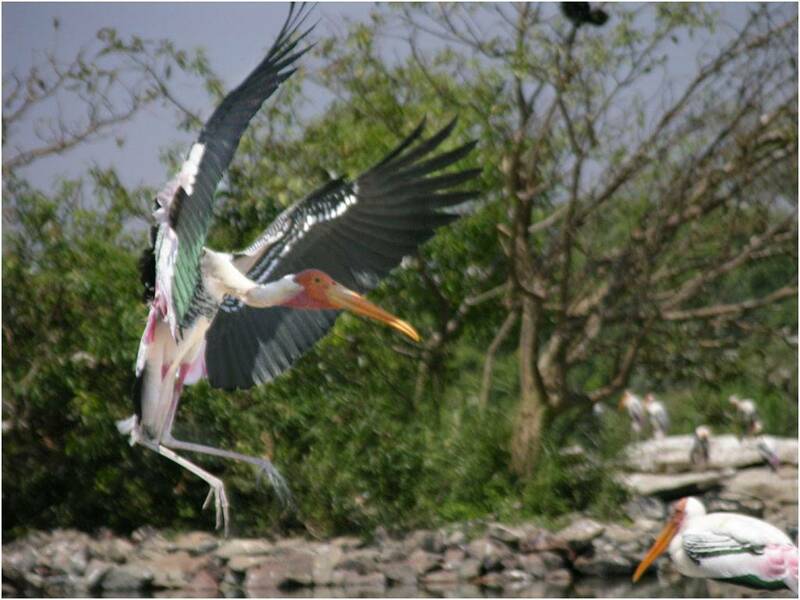 Nice photos of the painted stork landing. Samsara is nirvana. Ordinary everyday life is reality. And being real is enlightenment. To seek enlightenment is to run away from it. Good for you if you're feeling restless it only shows how bright you are. I've been feeling particularly bitchy lately ;) that's why I deleted two of my blogs. Take care of your soul, my friend! Everytime I feel agitated and upset I come here to relax with these beautiful pictures. wonderful, wonderful photos... made my heart swell with happiness! thank you for sharing.... I'm off in search of the others. Thank you Caroline, sorry for late response, got back only today. Yes the trip was helpful, relaxing in bits and pieces. But when your friends are in pain and you can't do anything about it is the most miserable feeling you can get into. Anonymous, when you are in pain its difficult to move on and you can't assume that it doesn't exist. I tried to escape, but doesn't help much. ezee123, I can never get tired of taking pictures of painted storks, they are so entertaining, they helped me to forget my problems for a while. and be insensitive to what happens around you. You either achieve the state of nirvana or enlightenment and be insensitive (which defeats the whole purpose ) or never make an attempt to achieve it and feel the pain and suffering and hope for a better tomorrow. Lord boo ! whats wrong with you ? why are you talking sense ? It will make you sick. I love to see you make a complete idiot of yourself, thats being very very normal. I am a big goof myself. Love you dee sweetie ! That is not good Lorrain, Its not your loss, its our loss, i thought something wrong with my net connection or with blogspot, i tried and tried, PicturesL was opening fast but your poetry blog wasn't opening, wanted to write to you but I left town the same evening. Thank you Nostalgie. sorry for late response, I was away for a week. Came back this morning Tanya, hope everything is fine with you and family. Long time ago Suresh some one asked me when I am getting married. I said I don't know I may not get married at all. He said I am an escapist. Thats why I think I ran away for a week. Yes Suresh I'll be there. Thank you Hayden, There's lot more to come, I think I have to make a photobucket album for birds alone as posting more pictures here makes the blog slow to open. Sorry for my late response Hayden. You can't defeat me Lorraine, I am a professional when it comes to irritating people. I have a post graduate diploma given by myself, and I have decorated myself with medals for irritating my friends. I did Lorraine, your page rejected me, it said get out of Canada. please click on 'refresh' button in your mind and on your computer every day. I'll not be allowed into paradise anyway Lorraine, you are already inside, If by mistake I reach your gates, since you are a lady of few words only 'out' will do. ARE WE CIVILISED PEOPLE ?